— This essay originally appeared in SPOOK Magazine. // You already know how this story ends so I’ll begin ten minutes before the climax. We’re three or so legs into the final of the Don Smallgoods Invitational Darts Challenge at Etihad Stadium. The world number one is playing the Australian number one, the kind of line up one could only dream of in a final for Aus darts fans, but most of the audience has their back to the stage. This is what catches my eye as I glance towards the endless rows of trestle tables. I’m in the sponsors’ section, which is so close to the players you can see their sweat. I’ve been given access I never imagined – I’m not a sports writer, but I appear to be the only journalist here – and after researching so much about darts I’m rather enjoying the thrill of being this close to two of the best. But this story was always partly going to be about the crowds, so while I allow myself to watch the final properly, I’m always glancing to the reaction in the ‘outer bull’ area, and that’s why I see it before most others in my section. The whole outer pit has turned away from the play and have formed a cavernous circle around something. People are cheering, standing on chairs to film or get a better look at whatever’s happening inside, and that’s when I realise stage-side is the wrong place to be, even during the final. I make my way across sticky white floor, avoiding chairs and beer cups hurled overhead, to the centre of the mayhem. Yet this story begins even earlier, with that strange phenomenon you experience when you learn a new piece of information and suddenly find references to it everywhere. January last year, a friend who was a darts fan had a game on Foxtel. As I sat watching idly I was struck by the contrast of cartoonish WWF-style names for distinctly non cartoonish guys. Andy ‘The Hammer’ Hamilton, ‘Mighty’ Michael Van Gerwen, Simon ‘The Wizard’ Whitlock, James ‘The Machine’ Wade, Adrian ‘Jackpot’ Lewis, Phil ‘The Power’ Taylor, Raymond ‘Barney’ van Barneveldt, Gary ‘The Flying Scotsman’ Anderson. Part of the appeal was watching their bemused expressions as they were announced, each syllable of their names drawn out in that linguistic rollercoaster style of boxing MCs: Miiiiiiighttttyyyy MIKE eeeellllll Vaaaaaannnnn Geeeeerrrrwennnnn, escorted by glossy ‘walk-on girls’ in figure hugging dresses as their personal theme song blares. Van Gerwen, or MVG as he’s known, at just twenty-five is the current world number one and enters the stage to The White Stripe’s ‘Seven Nation Army’ as the crowd chants his name to the tune. Fifty-something Phil Taylor, a legend of the game who is regarded as the best darts player of all time and looks like he could be anyone’s dad, walks on to Snap!’s ‘The Power.’ The chaos and garishness of the setting only served to emphasise the normality of the players. An old English pub environment expanded to stadium proportions and hyped up into technicolour madness. It was utterly addictive viewing and I was hooked. Multiple friends, it turned out, were watching too, and whenever I mentioned the sport in passing people knew certain players. Darts seemed to be having a comeback unseen since the 1980s. In the UK, darts is now the second most watched sport after football, topping even cricket, and though not written about outside the depths of the sports pages, it is steadily gaining momentum here. The tournament at Etihad is now in its third year, and has seen a marked increase in crowds, up to 8,000 last year. When I speak with Stadium CEO Paul Sergeant, I ask why he decided to bring the tournament to Melbourne, knowing he’s a fan. It’s the rock star branding that fascinates me, and when I speak with top ranking UK player James Wade before the match he explains how his name was assigned. The one question I ask every person I interview is how they discovered darts. “Through watching Fox Sports.” Why are we seeing a resurgence in the popularity of darts here? “Foxtel. Foxtel. Without a doubt.” I hear that word so often the interviews begin to feel sponsored. As the meet and greet ends I make my way down into the stadium, which is now filling up. The publicist had given me a tour earlier of the empty stadium hours before it was open to the public. It was huge from the ground, humbling in size. Thousands of seats at hundreds of trestle tables with red 180 signs placed upon them, a sea of white and red like some weird plastic wedding. She tells me that each of the chairs are numbered, so after the tournament the night before the staff had to order the chairs numerically as well as setting them straight again. A piece of information I don’t write down, but am reminded of later as the carnage grows and all those carefully numbered chairs are pummeled and snapped. Walking out into the packed stadium now the whiteness only emphasises the colour, any drab suburban dress here is drowned out in the Flintstone, Ghostbuster, Oompa Loompa, fancy dress chaos. It’s cartoon animation: women in brightly coloured wigs and lurid sequin jackets, convicts next to Wonder Woman and Bat Girl. I queue up for a drink behind a human hotdog, maybe sponsored by Don Smallgoods but really who can tell? There’s tigers and Ninja Turtles, skeletons, criminals and clowns. Later, when the riot police arrive it’s sometimes difficult to tell them from the several who have come dressed as police officers and I feel like laughing but I’m too close to a can of pepper spray to fully appreciate it. When the tournament starts it’s a bucks’ night vibe where everyone chants and dances and for a while it’s elating to be a part. It’s utter crowd mentality and all you can do is be swept up. 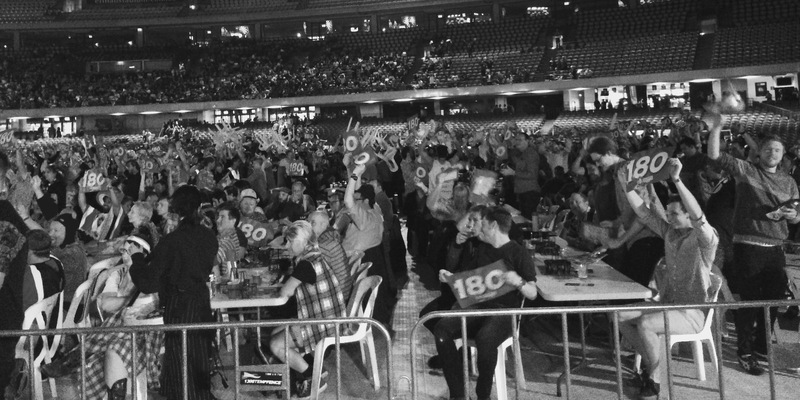 180s (the highest 3-dart score possible) are celebrated partly because they allow further celebration. There is a boyish gleefulness to the ability to dance and put chairs above your head. I’m told more than once in answer to my questions about certain traditions, “It’s the darts,” and for a while that answer seems good enough. It has its own logic and who am I to question it? Shouting, chanting, singing, drinking, dancing, general knocking into each other and hoisting chairs is the feel of the outer bull. The darts’ theme song, Planet Funk’s ‘Chase The Sun’ – the lyrics of which have no apparent relation that I can discern to darts itself – offers satisfying room between the chorus to chant ‘oi oi oi’ and everyone appears to know the drill. At one point Chumbawamba’s ‘Tubthumping,’ that 90s earworm, plays. The lyrics “He drinks a whiskey drink / he drinks a vodka drink / he drinks a larger drink / he drinks a cider drink,” bring to mind the classic BBC Not The Nine O’Clock Newssketch about darts I watched when growing up. Two comedians with pillows pushed up their shirts drink various ‘doubles’ and ‘triples’ of alcohol to achieve a score ranging from ‘fairly merry’ to ‘inebriated’ to ‘completely Newcastled’. Yet it’s the audience that now appears to fit that image far more than anyone on the stage. In the players’ change room earlier the focus was entirely on preparation for the tournament. I was told to wait for interviews while the players practiced. The vast array of drinks laid out for them backstage, whole silver platters filled with iced beers and spirits remains untouched. The players are mild mannered, respectful, proud of the game and their place in it. Whatever resonance the sketch may have had to the game in the 1980’s is lost now. It’s a lot harder laugh at men earning over a million pounds a year in a sport that’s watched compulsively in several continents. Back out in the stadium before the final begins, ACDC’s ‘You Shook Me All Night Long’ blares as I walk the outer pit. People are making their own fun, and I watch as several guys create an increasingly precarious chair stack on top of a trestle table. There’s a dress up pageant and a hot dog eating contest, which I unfortunately time to coincide with my own hot dog dinner. Is Don, is good. And then, the final, and the destruction. When I make my way back to the outer pit, plastic trestles are warped and broken—you can see the impact of the body slams on the tables. One wooden trestle is broken clean in half. Whatever I was dreading at the centre of the circle turns out to be a pile of white chairs, like the beginnings of a funeral pyre. An Oompa Loompa, along with Robin and a Monty-Pythonesque knight are in amongst the centre of the carnage. It feels as bizarre as those occasional fictional crossover TV specials where two cartoon shows combine. Play stops in the final, though few where I’m now standing notice. Etihad security are standing guard but it’s only when the police appear that things really calm down. A few more chairs are hurled but mostly people are taking photos of it. A group of guys who were at the meet and greet earlier, in 70’s afro wigs take selfies in front of the broken chair mountain the same way they had earlier in front of the players. So I had been wrong. Those dressed up weren’t the biggest fans at all. Many of them didn’t come for the darts. Not really. Only as much as people in the Birdcage at Flemington come for the horses. That’s not what the day is about. The darts are simply the excuse. Everything else is just soundtrack and backdrop. And so, unlike so many there, still tipping tables and chairs—now more warily, as police swarmed, pepper spray guns in hand—I watched the end of the final, which resumed because I guess, it had to. I knew enough about it by now, having researched the game knowing I would be an outsider, though it turned out I understood the basic rules better than some I spoke with. There was a 180, by MVG I think,I’d given up on my notebook by now,but the cheer this time was muted. There weren’t many chairs to hold up in the air now anyway, and the riot police were too close for anyone to try. Darts made a breakthrough outside the sports pages in Australia that night. It was the kind of senseless destruction that makes for good headlines and even better images, though it was hyped as more violent than it truly was. I was a lone female and I walked right up to the mayhem without ever feeling unsafe. Only three people were injured, two for tripping and one for feeling unwell. There is far worse violence at sporting events than this. But the headlines had already run and my newsfeed was all darts riot. The violence done was to property, important yes but not of the type that many of the reports implied. The real violence done was to the game itself. At the time of writing, Etihad continuing to host the tournament is in serious doubt. Before the game I asked Sergeant about what has made darts big here. “It’s atmosphere,” he tells me. “It’s atmosphere one, two and three.” But the balance that night tipped too far into the atmospheric . Dressing up and drinking is an integral part of the European darts culture, but the game is always at the centre. Many in the outer pit had gleefully taken up the paraphernalia around darts but without any conviction in the reason for it. And it felt like a shame. Amid all the rock show elements, the brilliance of darts is the purity and simplicity of it. Stripped back of the branding, or the chaos and colour of the crowd, darts offers at base the spectacle of a guy (yes, all the top players are men) up there alone attempting something minutely difficult. “Man against man, referee in the middle, no one else to blame,” MC John McDonald describes it to me. Because the game is small and precise—a millimetre is the difference between winning and losing—it is uniquely suited to television, and perhaps on the couch is where many of the greatest Aus fans remain. Though it would be a mistake for Etihad to cancel the events. Darts will continue to grow; the publicity from the riot will only draw further attention to a sport already gaining momentum here. But that lack of respect cuts both ways. Most of the jokes following the event were ironic comments about how unexpected it was that darts crowds would behave in such a way. As one wrote on Twitter, “I’m surprised at the senseless violence at the darts, the crowds always seem very cultured and intelligent.” Though darts are proudly working class in the UK, it’s a dirty word here because we like to pretend class doesn’t exist, even while the concept was simmering beneath much of the commentary about the ‘riot’ in reports afterward.